HRmarketer.com Blog: HRevolution: Because they come in three's. HRevolution: Because they come in three's. Evolve the HR profession; evolve as a business partner; grow the business. They always come in three's, don't they? The things we learn that is. The things that stick. The things we want to do something about. Yes, neuroscience says up to seven, and the limbic well beyond that, but work with me here. HRevolution was a pretty amazing one-day HR unconference this past weekend I was fortunate to attend and participate. Unconference meaning loosely structured sessions facilitated by multiple people to ensure attendee participation in any and all discussions, including any sidebars that develop within and without. And there were many of them amongst the over 130 people in attendance. Kudos to the HRevolution Planners, some of the brightest minds in the HR space. Everything's prettier in pink. Not one of the three, but I do want to thank The HR Technologist, Bryon Abramowitz for buying me a pink shirt. Because I'm having two girls and I haven't worn a pink shirt since 1984 (although some college friends would argue I wore them beyond that). 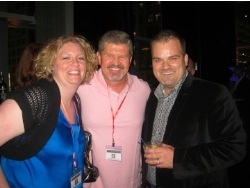 In the picture below is Jessica Miller-Merrell (Blogging4jobs), me and Eric Winegardner (the Monster man). The power of influence. Can be pretty powerful. So powerful that I've been influenced to buy a few different books I've never read including Influence (thank you Paul Hebert from Incentive Intelligence). The discussion on influence as it related to employee engagement and motivation was much bigger than the one hour allotment and I was completely in awe of the intelligence tendrils connecting each one of us in the room. Some very smart people to be around. I hope osmosis really works. Informal learning is more powerful and lasting with some formalized processes. Nature abhors a chaotic knowledge vacuum and the only way to further the transfer of knowledge is to document it and create formalized processes and systems to share and distribute. These types of conferences and sessions are amazing incubators of learning, but we've got to make them available to those who don't attend. The gulf between HR vendor and buyer is still pretty darn big. HRevolution was fortunate enough to have Bill Kutik attend and also help moderate the HR Tech session. Although the sessions weren't necessarily representative of all size companies (more in the realm 2,500 or less), it was clear that vendors aren't reaching the small to mid-size buyer effectively, while at the same time the HR buyers aren't really sure what they need and if they need it. I made the statement that's like a junior high school dance with the vendors on one side and the buyers on the other and a big ol' disco ball twirling in the middle. Oh, and the vendors are throwing shiny objects at the buyers. Laurie Ruettimann hit it on the head for me and the HR practitioners in the room at the end of the day Saturday, "Learn the business; get promoted; transform HR." And as Jason Seiden said to the room, "Keep moving forward." And I'll just add, "Empower yourself; empower others; be the lead." Because they come in three's.